Due to the winter weather in Friday's forecast, the Eastern Cincinnati Conference boys basketball match-up between Milford and Withrow has been postponed. The game's will be made up on Monday, January 15 with the freshman game at 4:30, junior varsity at 6:00 and varsity at 7:30. 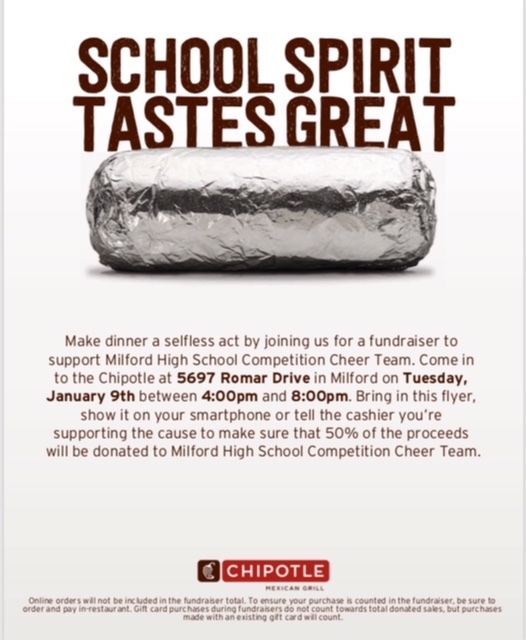 Eat at the Milford Chipotle on TUESDAY, JANUARY 9 between 4:00 - 8:00 pm, and 50% of proceeds will be donated to Milford Cheer!